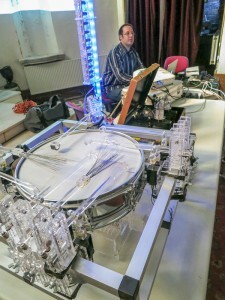 An ensemble of robotic musical instruments improvise with drummer Steve Snider. Sneak peak of a track that will be part of a forthcoming album from this session. 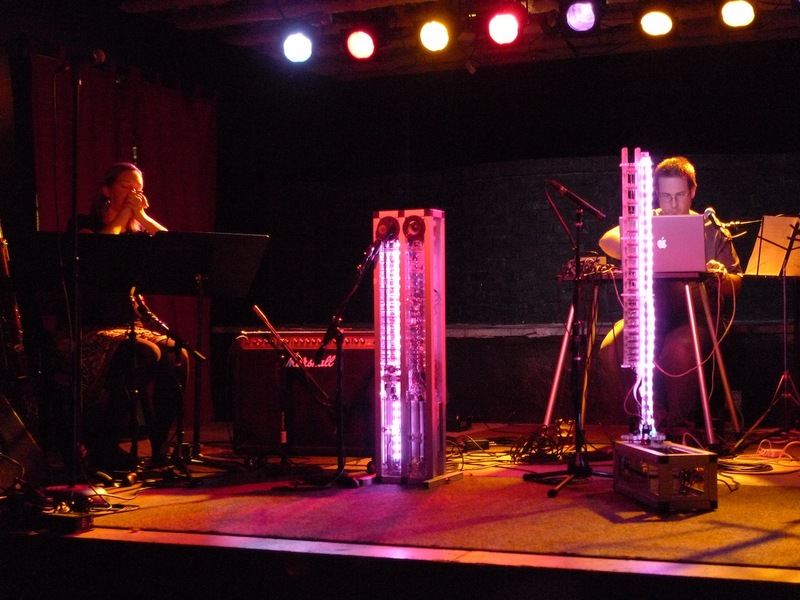 Musical robots: vocal robot Stemmetje, string robot AMI (Automatic Monochord Instrument), and clarinet robot CARI (Cylindrical Aerophone Robotic Instrument). The robots listen to the audio signal from the drums in real time, deriving pitch (which leads to interesting output given the noisiness of drums and cymbals), rhythmic, and timbral patterns. Steve also hears and responds to the robots, and the robots hear each other, giving rise to some beautifully chaotic feedback and noise in the control signal pathways, pushing the human-robot system into rock overdrive. When I arrived at the Logos Foundation in Ghent, Belgium for a residency in 2009, Godfried-Willem Raes had just completed : the “Hit AnyThing” robot commissioned by Richard D. James. I was tasked with creating a compositional study to explore and test the instrument’s capabilities in advance of the instrument’s eventual delivery to Aphex Twin. This is a recording of the resulting music. Troy Rogers performs music for robots at Sacred Heart Music Center in Duluth, MN.